A delightful mix of original recipes for delicious, low-fat fare, laugh-out-loud humor, and murderous mayhem stars caterer Goldy B. Schulz, who gets caught between a ruthless cosmetic company and a violent animal rights group. 45,000 first printing. $45,000 ad/promo. Tour. When Goldy, owner of Goldilocks' Catering, faces the challenge of whippingup a sumptuous lowfat feast for the Mignon Cosmetics' company banquet, sherises to the occasion brilliantly...only to discover just how ugly the beautybiz can be! On the day of the banquet Goldy finds herself confronting an angry mob ofdemonstrators--"Spare the Hares"--who object to Mignon Cosmetics'animal-testing policies. As she struggles to carry forty pounds of lowfat farefrom her van to the mall where the banquet is being held, she hears an ominoussqueal of tires and a horrifying thump. Seconds later, a Mignon employee liesdead on the pavement. And soon the police discover that this hit-and-run was noaccident. Now Goldy is enmeshed up to her saut pans in a homicide investigation.Could the murder have had something to do with Spare the Hares--or with theexotic flower found near the dead body? Though busy serving up Hoisin Turkeyand Grand Marnier Cranberry Muffins, Goldy decides to start digging at Mignon'smillion-dollar cosmetics counter. 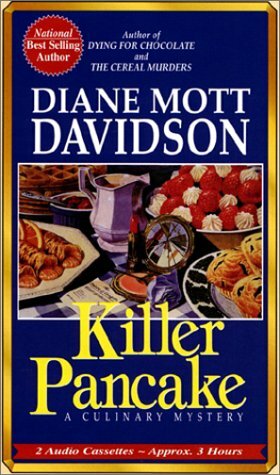 But when another murder takes place and Goldyherself is attacked, the caterer turned sleuth knows she must step up hersearch for a gruesome killer. For this time was only a warning. Next timeshe'll be dead--and it won't be pretty. Diane Mott Davidson lives in Evergreen, Colorado, with her husband and three sons and is at work on her next novel.